From the Editor: Maurice Peret began working as coordinator of career mentoring programs for the National Federation of the Blind Jernigan Institute in January of 2018. Having gone through the public school system in suburban Washington, DC, the term “partially sighted” was most often used to describe his status because of his very limited vision that would decline completely by the time he was in his early twenties. Although there was a chapter of the NFB in his area, he knew no blind adults after whom to model blindness skills or positive attitudes. He finally became a member of the Federation in 1991 through the mentorship of Ed McDonald who was then the president of the NFB of West Virginia where Maurice lived at the time. For seventy-eight years now the nation’s largest and most influential representative organization of the blind, the National Federation of the Blind (NFB), has developed and nurtured its single most valued and effective asset: its membership. The collective experience of tens of thousands of blind men and women, passed down through the generations from one to another, has contributed to the ultimate success and independence of countless blind young people to carry the torch of leadership and to live the lives they want. The cause of the Federation’s successful and long-standing reliance on and promotion of mentorship as a leadership development tool can be traced back to before the organization’s formation, to the unique and exemplary relationship between Dr. Newel Perry, an instructor at the California School for the Blind, and his protégé, Dr. Jacobus tenBroek. Dr. Perry earned a prestigious doctor of philosophy in mathematics degree with highest honors in 1901 before returning to his alma mater. He was a supreme teacher, scholar, mentor, friend, and colleague in his own right. Obviously Dr. Perry acquired life skills that allowed him to successfully overcome the myths and misconceptions that prevented other blind people from achieving similar success. More than a teacher, as a mentor Dr. Perry openly shared his experiences and strategies with Dr. tenBroek in a manner that allowed Dr. tenBroek to leverage those strategies to define his own future. Despite the capability their brilliant academic achievements demonstrated, both of these great, accomplished men had to struggle to overcome multiple brick walls to opportunities that society deemed insurmountable by them on the basis of their blindness. This struggle served to strengthen their determination to build the kind of national civil rights organization that would systematically chip away, brick by brick, at the social barriers that would confront future generations. In 1940 Dr. tenBroek founded the National Federation of the Blind, a nationwide organization of blind people that believes in the true capacity of blind people. Dr. tenBroek explained that the key to Dr. Perry’s “great influence with blind students was first the fact that he was blind and therefore understood their problems; and second, that he believed in them and made his faith manifest. He provided the only sure foundation of true rapport: knowledge on our part that he was genuinely interested in our welfare.” In other words, because he’d fought the same battles and faced the same barriers, his students believed his interest in their progress as students and developing humans was genuine and untainted by pity or charity. In the decades since Dr. Perry taught, research studies have empirically demonstrated that matching blind youth with successful mentors in this way increases their effectiveness in making decisions about their futures and increases their positive attitudes about blindness. 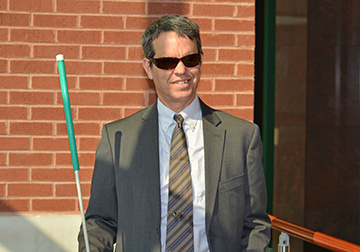 In October of 2004 the National Federation of the Blind Jernigan Institute received a five-year model demonstration grant from the US Department of Education Rehabilitation Services Administration (RSA) to develop a mentoring excellence program for blind youth between the ages of sixteen and twenty-six. With this grant, the Federation established a National Center for Mentoring Excellence to design, develop, implement, and evaluate a comprehensive national mentoring program to connect young blind people with successful blind adults. Today we are building on the quantitative and qualitative data collected from that experience to establish NFB CAREER Mentoring Programs across the country for blind youth with a stronger emphasis upon pre-employment transition services as outlined in the Workforce Innovation and Opportunities Act (WIOA). The NFB CAREER Mentoring Program combines best practices in mentoring with the philosophy of the NFB—a philosophy that combines high expectations, a positive attitude, the value of alternative techniques of blindness, and the belief that it is okay to be blind. In the end, we hope to instill a conviction in the blind women and men we serve that they can live the lives they want and that blindness is not what holds them back. The empowering role that mentors play in encouraging and modeling proven strategies and winning behaviors to young mentees can hardly be overstated. From the time they are very young, boys and girls begin to think about what they want to become when they grow up. Unfortunately, this is also the time that society begins to tell blind and visually-impaired children and their families that not only are they different from other children, but that this difference means that there will be less expected of them because they could never measure up to the expectations held for sighted children. Combined with the tendency for blind and low-vision youth to be underexposed to blind adult role models who are successful in a variety of technical, professional, and academic pursuits within the mainstream workplace, these societal misperceptions of the capabilities of the blind discourage blind children from using their imagination to combine their personal interests, aptitudes, and innate talents to dream big about what they want to be when they grow up. In the words of Frederick Douglass, “It is easier to build strong children than to repair broken men.” Mentoring has become an effective strategy used by millions of men and women and thousands of organizations to offer the necessary guidance and support to combat low expectations and cultivate success in groups of people who have not traditionally succeeded in their field. The NFB CAREER Mentoring Program highlights the power of combining best practices in mentoring with the philosophy of the NFB—a philosophy that combines high expectations, a positive attitude, the value of the alternative techniques of blindness, and the solid belief that it is okay to be blind. Mentors can share personal experience of successful and unsuccessful strategies for challenging situations including confronting public and employer attitudes; navigating through programs such as Social Security and Vocational Rehabilitation; managing accessibility in education; and learning about access technology and employment opportunities. Young blind people who are not connected to a network of blind mentors must continually reinvent the wheel by working through these challenges on their own. Our NFB CAREER Mentoring Program effectively uses the resources of thousands of blind Americans who have successfully navigated the path from education to career success and are willing to share their experiences and insight with young people. The NFB CAREER Mentoring Program matches transition-age blind and visually-impaired youth and young adults with successful blind mentors in order to: increase knowledge of and participation in the vocational rehabilitation process, increase postsecondary academic success, and increase high-quality employment and community integration. But unlike some mentorship programs where each mentee is matched with a single mentor, the NFB CAREER Mentoring Program is strengthened by matching each mentee with two to three. Information is gathered from the mentees about academic and career goals, hobbies, and extracurricular activities and used to match them with mentors who share interests or are successful in a career that matches with the mentee’s interests. This method has several benefits, including an increased exposure to educational, training, and career opportunities; a diversity of educational and work experiences for a student to learn from; an extended network of contacts for mentees to benefit from; increased community involvement and sense of belonging; and a more robust ongoing support system for the student as he/she tackles the early years of adulthood. Blind youth need exposure to positive blind role models who demonstrate a solid belief in the abilities of blind people and can, through guidance and example, raise expectations and offer practical tips and tricks for accessing resources and acquiring skills for success. When successful blind role models take a concerted interest in the lives of young blind people, expectations are raised about what can be accomplished. As dreams become reality, practical lessons are absorbed, often without even knowing that the learning is taking place. With an intolerably high rate of unemployment and under employment of working-age blind people in our nation, knowing what it takes to succeed in the vocation of one’s choosing is critical. Navigating the labyrinth of the special education, vocational rehabilitation, and other social systems while juggling the dissidence and mixed messaging of expectation imbalances can become perplexing and wearisome. The personal knowledge and experience of successful blind adults helps ground blind youth to internalize the philosophy that blindness is not the characteristic that defines them or their future. Every day successful blind mentors help raise the expectations of blind young people because low expectations create obstacles between blind people and their dreams. They come to know that they can live the lives they want; blindness is not what holds them back. As participants in the NFB CAREER Mentoring Program, blind mentees travel with mentors in direct learning experiences. This is done using alternative travel techniques such as the long white cane or guide dog and by demonstrating how to use public transit systems. Working with one or more mentors is the perfect environment for observing and practicing effective self-advocacy skills, all while learning to confront public misperceptions about blindness with grace, integrity, and respect. Blind employees as well as blind job seekers must be proficient in the use of access technology including text-to-speech software, screen enlargement software, Optical Character Recognition (OCR) programs, and refreshable Braille displays. Aspiring blind professionals must be prepared to address how adaptive software and equipment can be used to perform the essential elements of the job and be able to effectively educate the employer about how this reasonable accommodation would allow the blind applicant to be a productive employee. Blind mentors who have successfully navigated these situations are able to share their strategies with their mentees. The confidence derived from participation in a mentoring program equips blind youth with the ability to own the job interview. Roleplaying and role reversal exercises are useful activities in anticipating questions that may arise ahead of time and addressing them knowledgeably and confidently. Roleplaying between mentor and mentee is also an effective exercise that addresses social and professional morays such as appropriate attire, eye contact, hand shaking (e.g. when to and when not to), and being proactive and articulate in responding to interview questions. Financial literacy skills are also learned through practice in joint mentoring activities as blind youth are encouraged to engage in financial transactions such as paying for lunch or purchasing movie, paintball, or laser tag tickets. Mentees learn social protocol for calculating gratuity percentages and guide waitstaff in providing assistance in signing credit or debit card receipts. They explore banking options, learn to open a checking or savings account, learn how to balance their checkbook, and use web-based and mobile apps to track income and expenditures. Blind mentors provide guidance and empower mentees to effectively self-advocate and consider options that might otherwise have been dismissed. Introduction to successful blind college students, tours of local colleges and universities, and interest surveys inspire blind mentees to consider or reconsider higher education. There is no substitute for spending a day or more with a successful blind student or students to observe how challenges are managed. The National Association of Blind Students and its affiliated state organizations provide an abundant source of peer mentors. These experiences also prove valuable in integrating with other students and faculty, relationships that prove helpful in ways that are not always immediately recognizable. Because academic readiness does not always equate to graceful fluidity in public and social interactions, mock interviews assist blind students with guidance on how to engage effectively in an interview. Blind mentors provide useful tips on how to independently negotiate new environments, how to address the issue of disability prior to or during the interview, interact with Office of Disability Service staff, and strategize about the management of appropriate accommodations. It is widely accepted that job opportunities are generated most effectively through personal connections. Likewise, successfully employed or scholastically enrolled blind mentors share with mentees their accumulated networking experience in professional and academic associations, service organizations, fraternities and sororities, and especially through membership in organizations like the National Federation of the Blind. Many Federationists have stories of how mentorship by an older or more experienced Federationist changed their life. For some it was someone in their local or state chapter; for some it was someone like past Presidents Dr. tenBroek, Dr. Jernigan, or Dr. Maurer. And most of those Federationists talk about their determination to pay the time, faith, and confidence spent on them forward with new and younger Federationists. If you would like to know more about mentorship opportunities with the NFB CAREER Mentoring Program, go to www.nfb.org/mentorapplication and submit an application. If you are that young Federationist who would like to benefit from the advice and support of a mentor, go to www.nfb.org/menteeapplication to submit an application to become a mentee. This is how the Federation helps build a strong new generation of blind youth to continue changing the world until all of society believes that blindness is no true barrier to living the life you want.